When people think of an aviation accident (at least people who didn’t see this post’s title or read/experience the news story that inspired it! ), a midair disaster often comes to mind. However, a surprising number of plane crashes occur on the ground. Whether it is a collision between two planes near the terminal, a plane hitting an object while taxiing, or a runway incident as frightening as a failed landing attempt, our Oakland airplane accident attorney is ready to help people injured in ground aviation accidents. The San Francisco Chronicle reports that two aircraft collided on Sunday night at Oakland International Airport. A Southwest Airlines flight was leaving the gate in preparation for a short flight to Orange County when the end of its wing brushed against the wing of another Southwest plane. The sideswipe-style collision damaged the top of a wing tip on the departing plane, a Boeing 737. A passenger told reporters that travelers felt a sudden jolt, one that most passengers seemed to dismiss. He says he noticed the wing tip cracked and fell off while the plane continued to move, leading him to notify a flight attendant out of concern that the damage had not been noticed. Southwest Airlines released a statement saying both planes were taken out of service and maintenance checks will be performed. No injuries have been reported. On the positive side, Traveller reports that guidelines released in 2009 appear to be helping. However, as both reports note, air travel is becoming increasingly common. Therefore, even a reduced rate of accidents could still result in an increased number of accidents and injured individuals. Ground aviation accidents occur off the runway too and are sometimes termed “ramp accidents.” These accidents occur in the area near the terminal and on taxiways used for travel between gates and runways. The non-profit Flight Safety Foundation (“FSF”) developed a Ground Accident Prevention program that is often cited as the leader in this area of aviation safety. 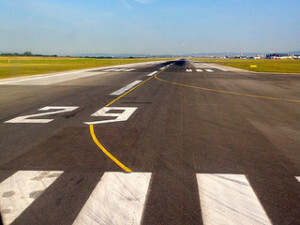 According to the FSF, 27,000 ramp accidents occur each year across the globe, a figure that works out to about 1 incident for every 1,000 departures. The group further reports that these incidents injure approximately 243,000 people each year, about 9 people for every 1,000 departures. While this post focuses on accidents involving aircraft, we’d be remiss if we didn’t mention ramp accidents that don’t involve aircraft, such as accidents involving baggage transit devices (“tugs”) and terminal shuttle buses. A USA Today article from late 2014 notes that at least 99 people have been killed in ramp accidents since 2001 (this appears to include both accidents with and without an involved aircraft). However, that is only one organization’s figure. The government does not tabulate ramp accidents because three different agencies investigate the incidents depending on the details. Aviation accidents are as varied as crashes involving land vehicles. We serve victims of Oakland and San Francisco plane accident injuries and those grieving a relative lost in an aviation accident, regardless of whether the accident happened midair or mere inches feet from the terminal and regardless of whether it involved a jumbo-jet or a two-seater. We also serve others injured due to airport congestion including people hurt on shuttle buses, hit by baggage equipment, or injured in the terminal. No matter the circumstances, we commit ourselves to understanding the factual circumstances surrounding our client’s aviation-related injuries.